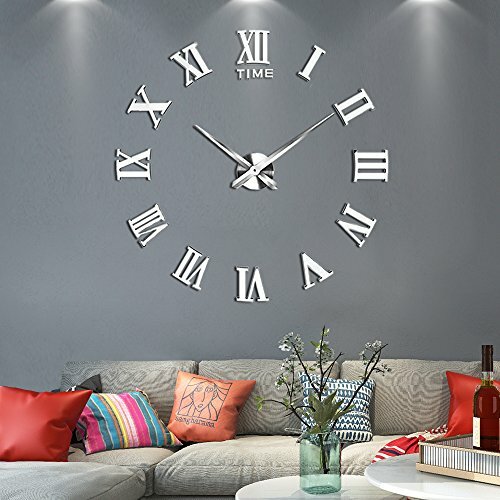 Vangold Large 3D DIY Wall Clock, 2-Year Warranty Roman Numerals Clock Frameless Mirror Surface Wall Clock Home Decor for Living Room Bedroom by Vangold at The Living Wall. MPN: HG-087-SR-US. Hurry! Limited time offer. Offer valid only while supplies last. Warranty - 30 days full refund and 2 Years warranty, Please contact us if any problems, and you can get a free replacement without a return. Modern Design: Large Size for Wall Decoration, acrylic mirror surface let your room get a stylish and modern atmosphere. Enjoy the Fun of DIY: Create your own unique wall clock---Combine the clock with a coffee table or round wood board, colour the numbers as you like,and so on. High Quality Clock Mechanism: The movement will last long and maximum reduce power consumption. Easy to Install: Package includes self-adhesive stickers and auxiliary scale ruler for easier installation.Each mirrors have a protective film, please tear off after installation. If you have any questions about this product by Vangold, contact us by completing and submitting the form below. If you are looking for a specif part number, please include it with your message. Blank Magnets (2 Pack) – Rounded Corners 12" x 24" Blank Car Magnet Set – Perfect Magnet for Car to Advertise Business, Cover Company Logo (for HOA), and Prevent Car Scratches & Dents – New!